The Open University (the OU) is the global leader in online education, promoting educational opportunity and social justice by providing high-quality university education to all who wish to realise their ambitions and fulfil their potential. Every day, millions of people access free OU content, no matter where they live in the world. The Open University selected Hydra in July 2017 as the platform to help optimise the creation and development of its online courses and materials ensuring the highest quality of service to all students and Open University users around the world. Sacha Holmes, Hydra’s Digital Marketing Manager recently chatted to Richard about how Hydra has helped the OU improve its project & resource management capabilities, by putting the power back in the hands of its project managers and giving them a 'Single Source of Truth'. What was The Open University like before Hydra? “Moving in to my role within the Production Hub Programme we were tasked with building on the technology at the Open University. We had built up a huge technical depth in what we were doing, but everything was very manual, and we were building these processes that involved lots of people, doing lots of things in lots of places but not really having a single source of truth. One of those specifically was in and around how we manage projects within Module production. Everything was done in excel, in access databases, trying to do bits and pieces on paper, via email all through these different routes and part of the requirements gathering piece we were doing we identified where there was a real lack of ownership within project management. Why did The Open University choose Hydra? “We went through a huge requirements-gathering piece, we identified issues and stories and had interviews with lots of project managers. This came shortly after all our project management staff went through the APMP training. We created a clear methodology to follow with the requirements of putting the power back in the hands of the project managers and giving them a single source of truth of what they were doing, and they had a single place they could go to manage their projects. 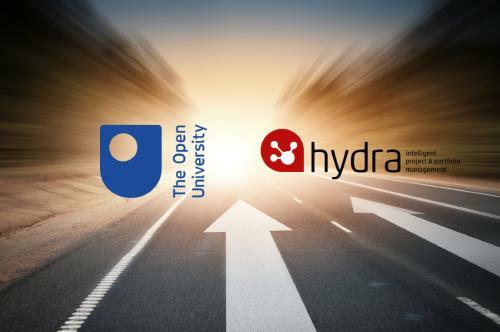 How has Hydra helped The Open University meet its challenges? “The key bit for us, was in terms of the link between project management and resource management. The project manager would throw some numbers together in terms of hours and they would pass that to a resourcing team, but they couldn’t identify exactly where those hours would be allocated. An example would be, I want 20 hours for March and 20 hours for April and they wouldn’t know whether those 20 hours were at the beginning, middle or end of the month. What Hydra quickly allowed us to do was identify where to allocate those hours and where the commitment was needed, and it put the onus back into the hands of the individuals, so they knew what they were allocated to, and had quick, direct access to the information to do their job or the information that was required of them. And as soon as they updated their hours, it was a live update to the project manager and they could see it off the bat. It also helps with project updates. Before, quite often we’d have progress meetings and the project manager would ask every member of the project team to provide an update. That could be a three-hour process having a conversation with everybody. And most of the time it was a bland update to what they’d done which wasn’t really benefiting anybody. With Hydras update system you can quickly identify the processes or where the blockages are, and you can actually have a real conversation to identify where the problems are, and you are not wasting anybody’s time, so that is one of the best things we quickly identified when we moved to Hydra. What’s the experience been like working with Hydra’s project and resource management solution? “My personal experience is great, I think the tool is really powerful. The complexity of it is almost its best attribute and its biggest flaw with the way that everything links in together. I’m an advocate for that but if somebody is wanting something that little bit similar I think they would struggle with how it all interlinks. But I think it’s a really powerful tool. If you have an embedded project management methodology I think Hydra is one of the most powerful things you can use, if you don’t have that methodology embedded into your core project management, it blurs the lines, people struggle to understand the terminology and they don’t understand how its interlinked. There is a certain level of education needed. What sort of improvements have you seen since using Hydra? “Some of the hugest benefits and improvements we’ve seen is the way project managers use it as a way of managing their staff better and managing performance. In terms of our specialist staff, they’ve seen a real change in the way things are planned; it is a little more controlled now. The more proactive project managers have really benefitted from the tool, they’ve seen a real benefit of how they manage their projects, they’ve seen a huge difference in efficiency and productivity and cost. What’s it been like working with the Hydra team? “I’ve got nothing but praise for the Hydra team; Juan, Manfredi, Sam, Tim, James, and of course Phil, have been nothing but supportive. They’ve been really proactive about identifying how we can improve as a Business and how we can improve as a partnership. I would like to thank Richard for taking the time to speak to me and for sharing his experiences of working with Hydra and the Open Universitys quest for a 'Single Source of Truth'. If you would like to learn more about how The Open University optimised its course creation and management please download the Case Study.